New to the district? Whether your child takes the bus or not, you can find your neighborhood school by using our bus routing system. You will be asked to login. Please enter “guest” and “guest” under the username and password fields. When the Versatrans e-Link page opens, enter your child’s grade level. From there, follow the commands to find your neighborhood school. It’s that simple. The 2016-2017 school year was the first year of Edmond’s newly redrawn school boundary lines. Maps indicating the new boundaries are below. The Board of Education has approved several attendance exceptions meant to lessen the impact on families. Please review the attendance guidelines. The EPS Intra-District School Site Enrollment Exception Request is specifically for 5th or 8th graders to use to seek permission to access the “Sibling Exception” to follow an older sibling to the middle or high school the older sister/brother is attending. Requests have already been received and processed for this year. Siblings must be living in the same household to access this option; the term “sibling” means brother or sister (not cousin etc). Please note that families will be responsible for transportation. The EPS Intra-District School Site Enrollment Exception Request is also required for ROTC admission, along with an interview and acceptance document from Col Young. Please call Edmond North High School at 340-2875 for more information. 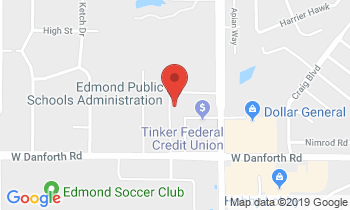 Parents of elementary students may request a transfer to another Edmond school, but they will have to attend the middle school in their residential area, unless they have a sibling in the school when they arrive. A Realignment Committee of more than three dozen school staff members, parents and teachers representing high schools, middle schools and elementary schools crafted the boundary proposal presented to the Board of Education in February 2016. Click below to access the notes from those meetings. Realignment Committee members studied data provided by Templeton Demographics to assist them in making a boundary proposal. Among the data that Templeton compiled is current and future neighborhood demographics, enrollment projections, and school capacities. Click on the links to see the Request for Proposal supplied by Templeton and approved by the Board of Education. The proposal and the rationale for the proposal were made public during two forums at the District’s Administration Center. It has been 18 years since Edmond Public Schools has undergone a district-wide boundary realignment. Since 1994, the district has undergone nine different boundary adjustments due to the opening of new schools and student population shifts. During that time period, the district has grown by nearly 8,000 students to become the third largest district in the state and the fastest-growing district in central Oklahoma.